Sackler Trust And Foundation 'Temporarily Pause' Donations To U.K. 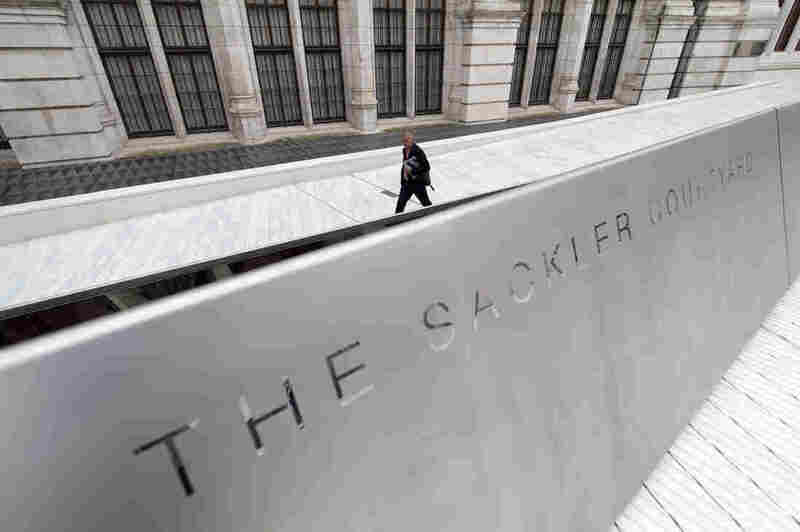 Museums Two philanthropic arms of the Sackler family announced they will "temporarily pause" gifts in the United Kingdom. The family owns Purdue Pharma, now under fire for its role in the opioid crisis. The Sackler Trust and Foundation both announced they would temporarily suspend charitable giving in the U.K. The Sackler Courtyard is a 2017 addition to the Victoria and Albert museum in London. But members of the Sackler family own the pharmaceutical company Purdue Pharma, the creators of OxyContin. The company is facing multiple lawsuits for lying about the addictive quality of the drug, helping to spur the current opioid crisis. A separate foundation made up of members of Mortimer Sackler's family, also sent a statement, which reads, "In line with The Sackler Trust decision, the Trustees of the Dr Mortimer and Theresa Sackler Foundation have taken the decision to temporarily pause all new philanthropic giving, while still honouring existing commitments." Within the past week, the United Kingdom's National Portrait Gallery backed away from a planned donation from the Sackler family, and The Tate Museums announced they will not accept new donations. Purdue Pharma has, in the past, pleaded guilty to misleading the public about the addictive quality of OxyContin, and has agreed to pay millions of dollars in fines. But a new wave of lawsuits implicate members of the Sackler family directly. One from Massachusetts accuses Purdue Pharma of paying members of the Sackler Family more than $4 billion between 2008 and 2016. Artists and activists, led by photographer Nan Goldin, have held protests at U.S. and U.K. museums which have accepted Sackler money. The Guggenheim Museum in New York has stated it received a total of $9 million in gifts from the Mortimer D. Sackler family between 1995 and 2015, but haven't received any contributions from the Sackler family since. In January, the Metropolitan Museum of Art, also in New York City, said it was reviewing its gift-acceptance policies.